I was browsing online to see if there are great things that I can work on our son’s bedroom. You see, we have been here for 6 months now yet; I still work on a DIY project with his room. There are some arrangements that need to be ready, as well as the organizing his stuff. I have a 3 years old son that is so rambunctious and needs to organize his room the way that won't hurt him. I’m glad that I found some options online on this website that I came across. Here are the options; I do find that would be great ideas for a boy’s bedroom. Traditional Kids by San Ramon Interior Designers & Decorators Martin Perri Interiors, Inc. The 3 designs in the photos are all great palettes. I guess, your choice will be dependent on the overall design of your home to ensure design scheme continuity. Good idea for boys; a double-decker bed with other parts to be utilized. Bunks beds is a nice idea if you have another siblings or sleep over. I love that first one, I wish our house is that spacious. 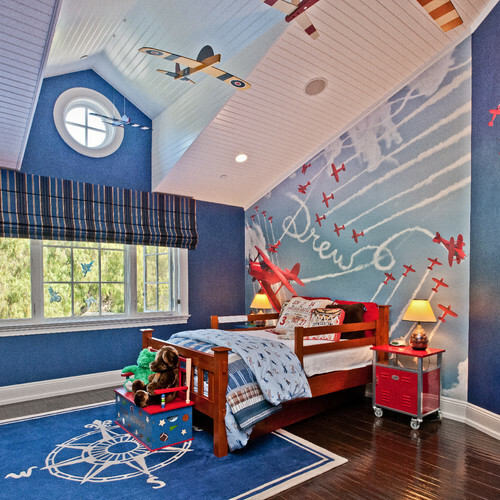 I super like like like the wall decal in the airplane themed room! I am likewise on the lookout for redesigning ideas for my son's bedroom as he is already a teenager and his present room arrangement seems too cluttered as it is. All the rooms designs look great Im sure every boy would want to sleep in one of these, but I bet they require large space, eh.